Theology of the Holy Spirit is vast. Bigger than anything I could know or understand fully, but I can speak to my own experience and thereby, hopefully fulfill the essence of the Hillsong homework assignment. The basics about the Holy Spirit are found in Acts 1:4-8 and Acts 2:1-13. The first passage carries the promise of Holy Spirit from Jesus Himself and the second passage describes the Holy Spirit’s appearance and “baptism” of the believers gathered there. We are told that the Holy Spirit is a gift and a source of power, and ultimately the resource for activities of believers from that day forth and forever. The first expression of that baptism was speaking in other tongues (not glossolalia at this point, but truly other languages). And why? To reach as many people as possible with the news: the Holy Spirit is here. This anointing impassioned the believers with confidence to tell their story, to proclaim the resurrection of Jesus, the Christ, and the Presence of God’s Kingdom. The message was (and still is) that Jesus is who He says He was and that the sacrifice of the Messiah’s blood (our deliverer) was a restitution for the sins and separation of humankind from God – then and forever. 4 There are different kinds of gifts, but the same Spirit distributes them. 5 There are different kinds of service, but the same Lord.6 There are different kinds of working, but in all of them and in everyone it is the same God at work. And goes on to articulate gifts of wisdom, knowledge, healings, speaking in tongues, and so forth. At the end of the chapter, Paul lists some of the roles that can manifest by the Presence of the Holy Spirit operating freely in a believer. But then, in I Corinthians 13, the greatest gifts of the Holy Spirit are recounted: faith, hope, and love, but the greatest of these is love. But this teaching was not available to the early church, not until the Apostle Paul, a learned man, had his own Holy Spirit experience and filled the ultimate command of Christ to reach out beyond the borders of Judea and Israel. He was the one who trusted Jesus at his Word to reach to the ends of the earth, the ends of their civilization. Before that, they lived communally and lovingly, they surrendered to the way of nonviolence, they shared the teachings and stories they heard from Jesus (for it was wholly an oral tradition), and they opened their doors to seekers. They were also persecuted. But they persisted nonetheless. One day, I came home to my apartment from school, and as I entered the door, I literally experienced a whoosh of air, as though someone had opened a skylight. I dropped my bags and my hands reached up (a gesture which I was not aware at the time was common among the charismatics and their worship). I cried with a kind of joy. And I wanted to sing and praise too. But I had no history of songs to God. The only song that came to mind was the one I learned one summer at a friend’s Vacation Bible School, “Jesus loves me, this I know, for the Bible tells me so. . . ” I sang that song as I walked around my apartment for 45 minutes. Ecstatic. Drenched in the Holy Spirit. Later, when I shared my experience with my friend, he immediately asked about Tongues, for that was his church tradition. No tongues, no baptism. I was a bit crushed but decided to press along without his opinion. I knew what I knew and I knew what I felt. I was on fire for my God and my faith in Christ and the Presence of the Holy Spirit. Within a few days, I did have a language experience but not what anyone expected. My background is Latvian. I grew up in a Latvian home and it was spoken predominately by my parents until my father’s death when I was 9. After that, our family slowly drifted away from the Latvian community and I began losing my Latvian language. By the end of my twenties, I could barely hold a conversation. But one day, in the throes of my ecstatic prayer time, I began to pray fluidly and completely in Latvian. I engaged with God in the language of my human father (who never learned much English), and I experienced a healing and transfer of love from my lost father to my heavenly Father. Like the early believers in Acts, I too was un-churched. I did not know what was normal or not. I simply told everyone I met my story. I was a most improbable convert and several of my classmates recognized my transformation as God’s alone and they too reached out to Christ anew. That was more than 38 years ago. Who is the Holy Spirit for me now? Over the years, I have experienced many physical manifestations from being “slain in the spirit,” to “prophecy” and “words of knowledge.” I have (and still do on occasion) speak in Tongues and I have prayed over/with people whose lives were changed. No healings as far as I know. Today, the Holy Spirit is speaking to me more mystically than ever. I believe that Christianity is filled with paradox from turning the other cheek to going the extra mile. In the same way, I believe the Holy Spirit is within and without, here and not here. We cannot describe the Holy Spirit for that world is simply not us, not 3-D, not constrained by time or flesh. And for this reason, Holy Spirit is an intimate partner with our own personal spirit, able to direct, console, comfort, and teach. 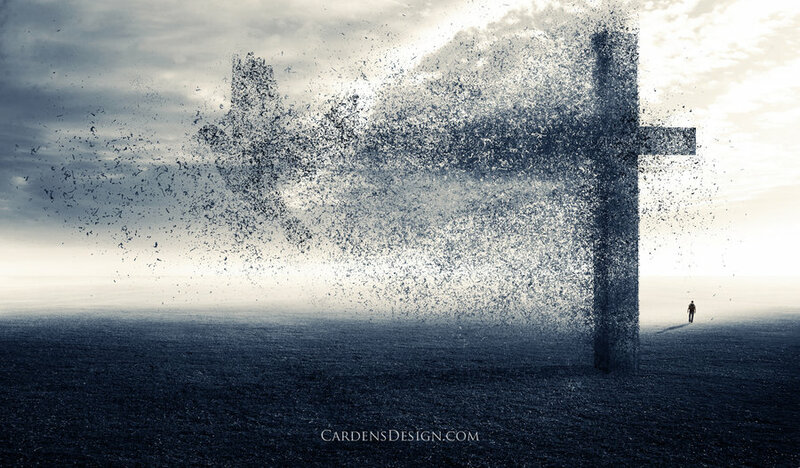 Holy Spirit can manifest physically — or not. Holy Spirit is breath and no breath. Just as God is the great I AM, so IS the Holy Spirit. I don’t know. Just sayin’ and I really mean it. First of all, it’s slightly different in Matthew and Luke. And for so so many years, I was like the rest of the Western Christian world and was speaking it in King James English. For heaven’s sake, what is that all about? It renders the thing beautiful but archaic. It became a rote kind of thing with little understanding or meaning. But then, for a long season, about a year and a half, I practiced a lay version of “Praying the Hours” and the Lord’s Prayer as well as the Gloria Patri and they always played a key part of those days. I became somewhat entranced by the power of the Lord’s Prayer and spoke it often and daily. Since that time, I have lost its potency, nor is it practiced much in my current church home. So what is God saying to me today? And there’s one other key here which I picked up during that year and a half. This prayer has always been and will always be a WE prayer, not an I prayer. When we prayer this prayer, we’re doing it together with a lot of other folks and we’re praying for them just like they are praying for us. This is a humanity prayer. Dogs don’t pray it and trees don’t pray it. Just us. Humans. And each and every human needs it. No strings attached. I’m coming back to this prayer. You should too.